This article helps you to protect your Windows 7 against security threats, privacy violations, and malware. These instructions are especially for digital nomads who are often travelling and working offline in remote areas using internet cafes with slow and unreliable internet connections. In such conditions, having your laptop suddenly download unwanted updates or get messed up is a nightmare. The same principles apply to all operating systems, not just Windows 7, as long as you have control over your system. Even if you are not a digital nomad, you might want to enjoy increased productivity, stability and security by controlling your own computer. 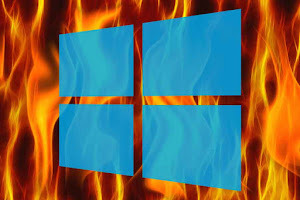 Microsoft has recently become desperate pushing Windows 10 to the unwilling users of older Windows versions. They have, for example, uploaded secretly up to 6 GB Windows 10 installations into Windows computers, delivered adware disguised as security updates, and misdirected customers who are looking for help in installing Windows 10 as a fix. If you migrate to Windows 10, there is no turning back as you can't disable the updates. Most likely, your current system is already compromised by Microsoft malware, so the only safe way is to re-install the good old Windows 7. Follow the next steps to secure your newly installed computer against Microsoft and other threats. Do not connect your computer to the internet before you have finished all these steps. Otherwise you risk having to re-install your system once more. Select from Control panel Programs and Features, click Turn Windows features on or off, and deselect Internet explorer (use Chrome or Firefox instead), deselect Media Features (VLC is a free and secure option) and click OK.
Avoid insecure software such as Adobe Flash player, Oracle Java, and in general all Microsoft made software, drivers, and updates. You don't need Client for Microsoft Networks or File and Printer Sharing for Microsoft Networks to surf the internet. Go to Control panel - Network and Sharing Center and click Change adapter settings. Then right click Local Area Connection if you use network cable, or Wireless Network Connection for WiFi, select Properties, deselect these two unnecessary protocols, and click OK. If you don't connect with Bluetooth devices, go to Control panel - Network and Sharing Center and click Change adapter settings. Then right click Bluetooth Network Connection and select Disable. Thanks to a bug, you can not detach USB devices unless Bluetooth service is running. If you use such devices, you can not disable Bluetooth. Disable autoplay/autorun from Control panel, with group policy or from the registry to disarm a lot of malware. Select Control panel - Folder Options - View tab. Select Show hidden files and deselect Hide protected operating system files, click Apply and OK. Install a firewall and a virus scanner that are not made by Microsoft. We are using the free versions of Avast antivirus and ZoneAlarm firewall. Backup your own files regularly, but not Windows 7. When (not if) your computer gets messed up, it is faster, safer and easier to re-install Windows 7 compared to using recovery. Save all your installed drivers and software into a separate hard drive or a pen drive so you can easily re-install everything. Contrary to the popular misconception, updates do not secure your computer. It is better to remove and replace insecure software, disable unnecessary features, and block the most common ways in which malware creeps in. After your system is secured and you have made backups, it is time to think about updates. There are only a few things that need regular updating: the virus definitions of your virus scanner, firewall software, and web browser. As long as they are up-to-date, you are pretty well protected. All other updates should be considered case by case checking first what changes and fixes are incorporated, what else would have to be updated or changed, and whether you really need the update. Every update is a risk and might force you to update or install first something else, render your application useless, or in the worst case mess your operating system. Updates can make your computer slow, bloated and prone to crash, and they tend to eat up your internet bandwidth. A good rule of thumb is that updates create more problems than they solve. I posted this article originally to my travel blog on March 14, 2016.